Teens! Join our biweekly gathering for socializing and mindfulness. Being a teen can be rough, especially in these challenging and confusing times. In Dharmic Warriors we will explore the challenge of simply being human through the Shambhala teachings of Basic Goodness and Kind Warriorship. This will be a safe open space to bring questions, fears and inspiration. What do we FEEL? What do we LOVE? How can we be Kinder to ourselves? How can we develop inner Strength? Come Hack your Brain and Share your Heart! Our teachers will share contemplative activities and teach meditation practices and then we'll eat pizza and hang out! 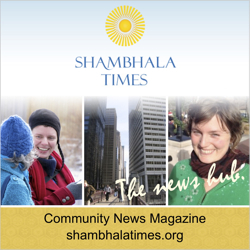 Dharmic Warriors provides teens an opportunity to form close friendships with peers and to make their own connection with Shambhala Buddhist teachings. The biweekly program includes meditation, a short talk, discussion, and some teachings and activities that are appropriate for teens. The second aspect is social, with food and conversation. Questions? Contact Nicole Wolf at [email protected]hala.org. This program is free, but donations are appropriate and appreciated.